On Museum Volunteering / Internships | What can I do with a B.A. in Japanese Studies? Our main article kicking off the 2012 year is a guest piece by Travis, an MA student in art history who also runs the blog “茶有の者 – A Man with Tea.” We’re happy to have him and look forward to hearing more about art and museum studies! A career in the arts & museum field is one of the many paths one can pursue with a degree in Japanese Studies. An important step getting your foot in the door is to volunteer or intern at a museum, gallery, or other kind of cultural institution. 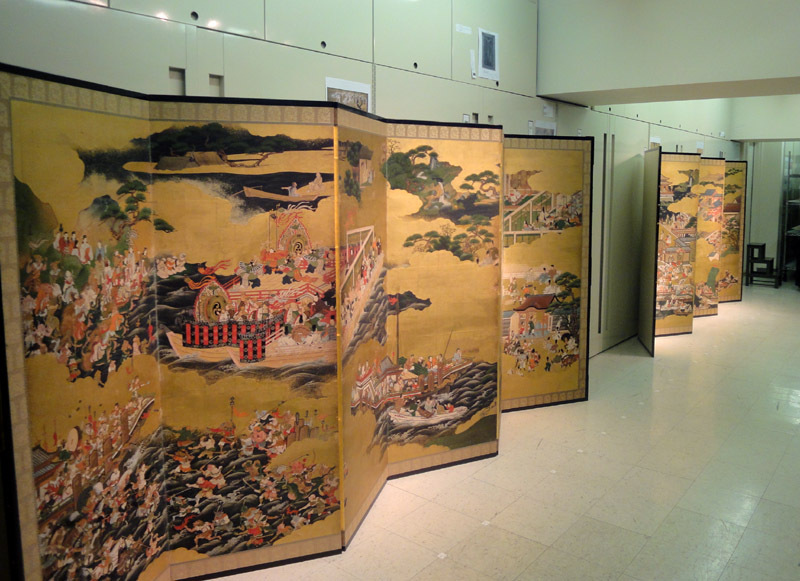 A behind the scenes look at 17th century Taishokan scrolls. I did just that, interning with a curator of Japanese art at a major US art museum shortly after completing my BA. Since then, I’ve done several more volunteer/internships, earned a MA in Japanese Studies, and am right now working on finishing a MA in Art History, with the plan to go on to a PhD, and then (maybe, hopefully) a career in the museum world. Thanks so much to Paula for offering me the opportunity to share a few guest posts about my experiences volunteering/interning in museums and other cultural institutions. What I originally conceived of as a single post is now quickly beginning to look like a short series. This post will attempt to focus on how to find volunteer/internship opportunities and apply for them. Future posts will discuss the kind of work you may be expected to do as a volunteer or intern, give advice for pursuing a career in the museum world, and touch upon what types of positions exist and what they entail. Disclosure, I have yet to actually work a full-time professional research or curatorial position myself; but having interned and volunteered at a number of institutions, I’ve gotten something of a sense of the variety of volunteer/internships and how they function, and am happy for the opportunity to share what I have learned. The first step to securing a position as a volunteer or intern is to look for potential openings. Most museums list volunteer/internship opportunities on their websites. Sometimes these listings can be kind of hard to find, but often they’re under a link for “About the Museum,” or something like “Contribute” or “Support,” and are also often grouped in under “Employment” or “Careers.” Of course, asking in person at the museum’s information desk is always a good option as well. Many museums, especially the larger and more major institutions, have set application procedures involving letters of recommendation and statements of purpose. Some, such as the Metropolitan Museum in New York, have rather early deadlines. The deadline, for example, for Summer 2012 internships for college students and graduate students to apply to intern there is January 6. So, this is something to watch out for. At the same time, many museums (even larger ones) function on a more informal basis, while others may function only on an informal basis, posting no official volunteer opportunities, maintaining no set structure for how volunteers are handled, but remaining very much open to the possibility of bringing you in if you inquire about it. I found my first volunteer position by simply following the application procedures described on the museum’s website, where they advertised openings for summer volunteer opportunities. However, once I got that position, towards the end of that summer, I spoke with the Volunteer Coordinator (many larger museums have a designated department for managing volunteers) and asked if there was any possibility of a volunteer/internship in the curatorial departments working with Japanese art. There was no opening advertised or listed anywhere – I just asked. This is essentially the same thing your parents have been telling you about applying for a job; that even when there’s no listing advertised, sometimes you should just ask anyway if there are any openings. At first I, too, was loath to ask, loath to believe it could work. But, it’s true. Sometimes, even when there’s no opening advertised whatsoever, if you just ask about the possibility, a position will sometimes exist, or will be created. So, after an interview and submitting a few documents, I found myself interning with one of the top Japanese art curators in the country. Two friends at work checking books. They go through the book page by page, comparing each page to the photograph of that page, to make sure they're all in focus, and clear, and that no pages are missing. I guess that essentially what it comes down to is that it works both ways. Some of the most major museums, and many smaller ones too, have certain projects they are looking for volunteers or interns to work on and/or have well-coordinated programs specifically designed to help teach and train you as an intern. My latest internship worked this way – the museum had a very specific project that they needed interns for, and it was all coordinated out already, the timeline, the pay, the project, all funded by an outside grant for which they had applied. Of course, many museums also have people banging down their doors, so to speak, to get their foot in the door, so they have relatively complicated application procedures. While many smaller institutions can get away with a more informal way of doing things, the largest museums need to have a formal procedure or else they would just be inundated constantly with questions and offers from people who want to volunteer. Now, that said, pretty much every department in every museum is understaffed and has tons of work that needs to get done, and they could use the help. Whether they have the physical space to give you a workspace, or the time and flexibility to show you the ropes and to otherwise support you as a volunteer/intern is pretty much what will determine whether the second tactic – the cold call/email/letter when there is no posted opportunity – will enable you to get a volunteer/internship. So, especially if there’s something very specific you’d like to do – e.g. Japanese curatorial section, archives, museum library – for which there are no listings, it can never hurt to inquire. Sometimes this was a little more hands-on, as the curator walked me through an actual project she was working on at the moment, and explained about it; sometimes it was a bit more in the form of scheduled, planned events, such as having visiting scholars lead a workshop or lecture. If a visiting scholar had requested certain pieces be taken out for her to study, often so long as the objects were already out, we interns would get a chance to at least take time to look at them ourselves, and sometimes the curator would tell us more about them. A behind-the-scenes look with a museum curator: papers accompanying an early modern handscroll. elements of how exhibits are planned, gallery layout, collections management, database organization, what different departments or professional positions do and how they interact, and other valuable behind-the-scenes skills and knowledge. Plus, as you work with people directly in your area and meet staff members from other departments (either through occasionally collaborating with them or encountering them at museum-wide staff meetings, staff parties, etc.) you engage in valuable networking opportunities. While adding a prestigious museum to your resumé, you get to know curators and other professionals as you establish a relationship with the museum as a whole. This last part is of importance, since museums do very often hire their volunteers and interns; their familiarity with you, your familiarity with them, with their collections, with how they do things, are all very valuable. Two more things. One, don’t worry if you’re not an Art History major, or if your Japanese isn’t so good, or if you are concerned that there are other particular skills or backgrounds you are lacking. Depending on the institution, and what tasks need to get done that season, volunteer/internship positions potentially exist for every skill level– for high school students, college students, college graduates, and graduate students. When I began that first Japanese art curatorial position, I had a BA in History and East Asian Studies, only the most limited formal classroom background in Art History, and a rather limited grasp of Japanese. I couldn’t hold a serious conversation in Japanese or read a whole page of formal writing, but I could recognize kanji well enough to be given something written out, and to then find the same thing on the shelf, or in the files. During that internship, I learned not only about museums & museum work, and hands-on skills such as how to work with that particular database software, but I also learned a ton about Japanese art. Most of my foundational knowledge in Japanese art in fact came from that experience, as I worked closely with the collections database (and physical files) and came to know the names of major artists, and representative artworks of theirs, examples in my mind of their style. Two, don’t forget to look into other organizations that are not explicitly “museums.” While internships (or jobs) at a commercial gallery or auction house (e.g. Christie’s, Sotheby’s) are perhaps a different story entirely, there are many libraries, archives, Japan Societies, Asia Societies, cultural centers, and the like which also do interesting and exciting work, sometimes not all that different at all from museum work, and sometimes it may even be something more up your alley – e.g. organizing concerts or film screenings or special events, working in a library or archive, or being involved in coordinating language, music, art, or other culture classes rather than specifically art exhibits. And just because an institution may not seem quite so major, or quite so prestigious, on the surface, does not mean that it cannot provide an excellent experience, valuable networking, etc. My second internship experience was at an institution I had never visited before, and had scarcely heard of, located a bit of a ways outside of where a tourist would normally find themselves unless they were explicitly looking for this place. But I quickly learned just how active and vibrant the place was, how much a center it is for the city’s Japan-related activities, and how important it actually is in the wider (national/global) world of Japanese art in terms of groundbreaking exhibitions and important symposiums and events. I would love to hear your questions and comments, and will do my best to answer any questions you may have. I’ll be back with another post or two or three soon, discussing the types of tasks you might find yourself doing in a volunteer/internship at a museum, the different types of volunteer/internship positions that generally tend to exist, and more about professional career paths, what different members of the museum staff do, and perhaps (from what little I know) what you need to get to a museum career. This entry was posted in graduate school, interviewing, jobs, main posts, social networking, study tools, summer program, undergraduate and tagged art, art history, curator, curatorial work, employment, internship, Japanese art, museum, volunteer. Bookmark the permalink. Pingback: On Museum Volunteering / Internships: Part II | What can I do with a B.A. in Japanese Studies?